It’s hard to believe in the benefit of studying music after hearing stories about famous self-taught guitarists who have no formal music training. It seems a lack of theory is not holding them back. So why do you need to study music? Because it’s a HUGE mistake to think that famous players haven’t received training and don’t know anything about music! Take Eddie Van Halen. It’s often said he knows nothing about music. In fact, he’s often at a loss for words when he’s asked how he does things. “As is well known, the Dutch-born Eddie and Alex Van Halen grew up in a musical family. Their father Jan, who was a jazz musician, started them on piano by the time the boys were five years old. Those lessons continued after the Van Halen family emigrated from Holland to the United States in 1962. But from the perspective of Eddie and Alex’s parents, piano instruction didn’t represent an attempt to make sure that their children were well-rounded young people. Instead, it was training for their future careers as concert pianists. Making sure that their children achieved that degree of mastery required years of study and a special kind of teacher. ‘I played a long time,’ Van Halen once told Guitar Player. ‘Got all my musical theory and stuff from playing piano. We used to have this old Russian teacher that was a super concert pianist.’ This teacher served up some Old World discipline to make sure that the boys progressed. ‘[He] couldn’t speak a word of English,’ Van Halen explained. ‘He would just sit there with a ruler ready to slap my face if I made a mistake.’ These harsh methods, for better or worse, seemed to serve their purpose, as a young Eddie went on to win a number of piano competitions in greater Los Angeles.” ref. So it turns out Eddie DOES have music and theory training and A LOT of it! 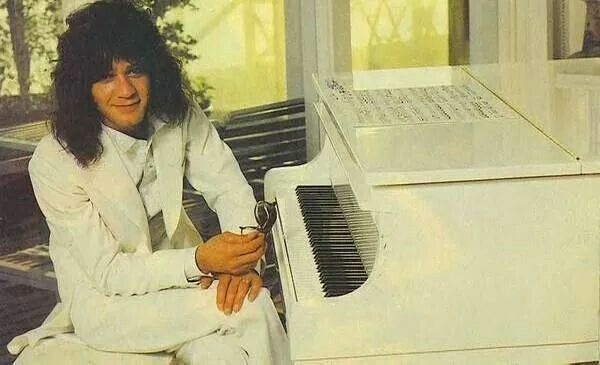 He obviously applied this piano knowledge to his guitar playing because we hear traditional elements of harmony as well as classical composition techniques in the music of Van Halen. It’s what sets Eddie apart from your typical blues/rock player and makes him such an amazing musician. Eddie doesn’t know how to communicate to others what he does musically but that doesn’t mean he doesn’t know what’s he’s doing. Eddie has it all worked out in his head and knows his way around the fretboard in a manner that makes sense to him. Does Self-Taught U2 Guitarist The Edge Have No Formal Music Training? How has U2’s David Evans (better known by his stage name “The Edge”) been so successful as a musician despite being self-taught and having no formal training? While it may be true that The Edge doesn’t have “formal” music training in the form a music degree, according to his Wikipedia page he took both piano and guitar lessons as a kid. He’s also from a somewhat musical family because his bio mentions him playing music with his brother. You also can’t discount the untold amount of hours The Edge (and Eddie for that matter) spent practicing his guitar. What do you think he was doing all that time? He was figuring out music on the fretboard so he would know how to play better. Throughout his whole career, The Edge worked with professional music producers and recording engineers. 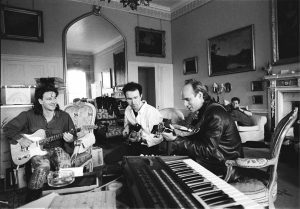 These music professionals were on hand during writing sessions, recording sessions, and tour rehearsals and they helped The Edge get the best out of his song writing and guitar playing. Guitarist The Edge honed his chops with help from professional music producers and recording engineers. So you’re right, The Edge doesn’t have any “formal” music training–he has something much better and much more comprehensive! …and this is the case for every other famous player we’re told is “self-taught” with “no formal training.” They all have benefitted from some amount of instruction as well as tremendous help from professionals in the music industry. Are the Members of Kiss Self-Taught Musicians with No Formal Training? How did Paul Stanley and Ace Frehley compose that epic harmonic minor dueling guitar solo in Kiss’ “Detroit Rock City”? Professional producer and keyboardist Bob Ezrin helped them. You could say the members of Kiss got a good lesson on scales and harmony that day! 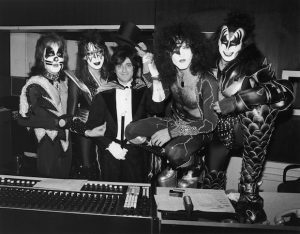 Producer Bob Ezrin guided the members of Kiss in the studio and helped to compose their most famous guitar solo. How Can You Become a Good Guitarist as a Self Taught Player? …then you’re going to need to do something else in order to hone your chops so you can play your best. Don’t worry, you don’t need to bring home a stack of old-fashioned music books and bore yourself to death trying to find something useful. Much of the traditional theory doesn’t apply to modern guitar playing anyway. Instead, I recommend you study resources that focus specifically on the guitar fretboard and popular guitar songs so you can cut to the chase and immediately make progress with your playing. You’ll have a lot more fun too when the things you learn have such a direct and practical application. In fact, this is precisely why this guitar music theory website exists. 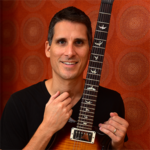 Visit the guitar theory page to see the kinds of things that will help you master the fretboard and understand everything you play. Check out the blog posts on this website to get inside the head of pro players and see how they map things out and put things together. You don’t need to have a formal music degree in order to understand music. And being self taught doesn’t mean you’re not taught. You can learn a lot on your own. You can learn just as much as a guitarist who is formally taught.